Looking for one of a kind Kauai Activities and Hawaii Zipline Tours? Join Princeville Ranch Adventures for a unique jungle experience on the pristine private lands of Princeville Ranch! The Jungle Valley adventure is not your typical Kauai Zipline Tours. 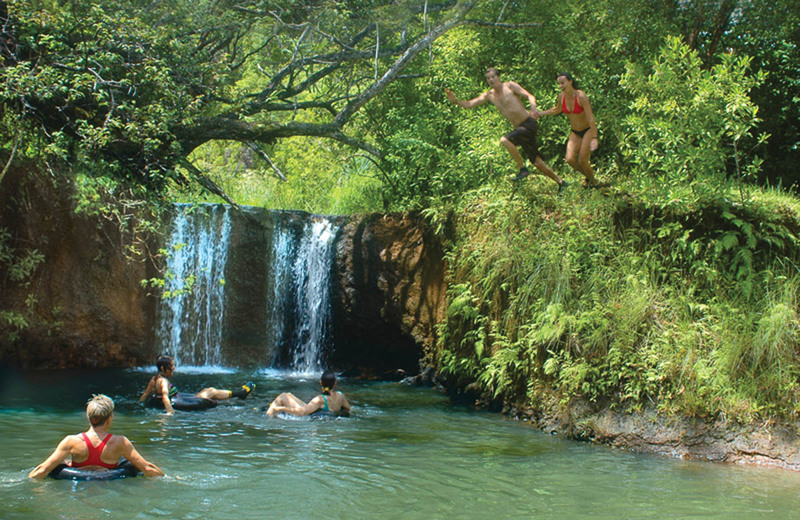 Princeville Ranch Adventures Jungle Valley Adventure includes several Kauai Activities such as kayaking, hiking, zipping and swimming. Come meet the real Hawaii on North Shore eco-tour Hawaii Zipline Tours. The Jungle Valley Kauai Zipline tours begin as you experience breathtaking views of the Hanalei mountains and approach the secluded Kalihiwai Stream. Kayak in Kauai through a peaceful rainforest valley filled with tropical sights, sounds and scents. Tie up and hike deeper into the ranch, negotiate several stream crossings and arrive at the spectacular Uluhe Fern Ridge. Here guests weighing between 80 and 280 pounds have the option to ride our two 400+ ft zip lines and connecting bridge over a pristine twin waterfall and swimming hole. If you choose not to zip you can watch or walk down to this peaceful spot. After the spectacular zipline, you can swim, jump, float on inner tubes, enjoy a fresh and delicious meal and relax. This heavenly private swimming hole is all yours! You can’t beat these Kauai Zipline Tours..
On the Jungle Valley Adventure Kauai Zipline Tours: Kayaking is beginner level and total round trip kayaking time is approximately one hour. Hiking is moderately strenuous, includes multiple stream crossings and is approximately 2 hours, round trip. Total tour time for these Kauai Activities is approximately four and a half hours. This is a one of the popular Hawaii Activities for kids. Princeville Ranch Adventures Tour Fee Includes: Experienced guides, Delicious meal, Backpack and Dry bag use - Starting July 1st Backpacks will not be included. They will be available for rent from Princeville Ranch Adventures for $5.00 (rate subject to change), Personal Floatation Device and exciting Hawaii Zipline Tours! Children age 16 or 17 can go on Princeville Ranch Adventures tours without an adult as long as a parent or legal guardian signs a liability waiver and physically checks in the child at our office. For other Hawaii activities and Hawaii tours, be sure to check out Hawaii Discount which offers all the activities on the Hawaii Islands such as Big Island Zipline tours to Pearl Harbor tours in Oahu. Feel free to call us at 866 482 9775 with any questions. Check in Office Location is one mile past the Princeville Airport on the ocean side of Kuhio Highway (Highway 56) in Princeville. Follow the "Princeville Ranch Adventures" sign. Located at mile marker 27. Please be aware GPS may take you to the wrong location. 48 hour notice of cancellation is required. 72 hour notice is required for groups of 6 or more. Must be 5 years or older. Must weigh between 50 and 280 pounds (guests who are planning to zipline will be weighed at check-in). Children 5 to 15 yrs old must be accompanied on tour by an adult who is at least 18 yrs old. Closed toe shoes - preferably sneakers, tennis shoes or hiking boots, (NO aqua socks or 5 finger toed shooes), amphibious closed toe trail shoes are fine. Princeville Ranch also rents shoes for a nominal fee. Your shoes may get wet and muddy on this tour! Guests are encouraged to wear bright clothing as they will show up better in photographs. Theses Kauai Activities are open Mondays through Saturdays. * Operates Monday through Saturday. Sundays available in July & August.